The smell of cinnamon and coffee lured me out of my warm cocoon of sleep. I blinked into the early morning sunlight filling the parlor and listened to the echoing quiet of the house. The soft drip of Mae’s coffee maker confirmed that the power had returned and the brilliant blue outside the window revealed a crystal clear sky. I realized I must have nodded off in front of the fire last night, because I was still camped out on the floor, but somehow I had acquired what felt like a pillow. It was a bit too firm though. I moved slightly and realized the pillow was attached to a perfectly sculpted forearm . 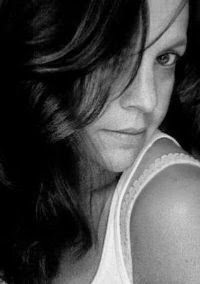 . . and hand, which had my long hair gently woven through its fingers. Something warm and solid tightened around my waist and my eyes widened as I realized Raef was tucked against my back, one of his arms supporting my head and the other clasped around my waist. Sweet baby dolphins everywhere, Raef was SPOONING me, pressed firmly against my back. Now acutely aware of my surroundings, I could feel his warm breath on the back of my neck as he slept. I wanted to turn to him, but I was terrified he would wake and realize he had jumped headfirst into those revisions we had briefly mentioned last night. Heck, he was WAY MORE than touching me. He was holding me as if I would disappear - as if I would fade into the molecules in the air. I swallowed and stayed still, taking inventory of his hard body against mine, and how we seemed to fit so perfectly together. A metal pan scraped against something in the kitchen, breaking the silence of the house, and I felt Raef take a deep breath and stretch ever so slightly. I stayed still, hoping he would think I was asleep. Hoping he wouldn’t suddenly shoot across the room, taking with him the warmth and safety I felt in his arms. He didn’t move for what felt like forever, keeping his arm around my waist, but then I felt him softly spread his fingers out over my stomach. It took everything I had not to spontaneously combust. I felt his forehead touch the back of my neck and he drew a slow, deep breath against my shoulder blade. It sent electricity fanning out from my skin and down my arm. All ability to control myself fled my body and I dragged in a shaky breath. He loosened his grip and I rolled onto my back, his arm still behind my head and his hand just below my belly button. His fingers grazed the area of my skin that was now exposed thanks to a too-short tanktop. God bless the discount rack at Abercrombie. “Uh . . . Good Morning,” I said, my voice a little dry. Pfft . . . no worries! “You just needed a snuggle-buddy,” I replied, flashing him a knowing grin, but my face started to flush. Oh my god . . . that was so lame. Raef’s gave a soft smile and was about to reply, but a paisley pillow shot up from behind him and wacked him in the back of his head. “HEY!” he protested. I blushed hot and sat up as Raef’s hand fell away from my tummy. He slowly got to his feet, tossing the pillow that attacked him onto the couch. He stretched, looking really well rested for the first time in weeks, and his black t-shirt rode up just enough to torment the heck out of me. He looked down to where I sat on the floor, scrambled hair and silly PJs most likely making me quite the sight to see. “I’m going to go bring in some more wood and see if Mae needs anything,” he said, taking his fine self and walking into the kitchen. I heard him greet Mae, though Mae returned a clipped Hello, and then the side door closed. “SNUGGLE BUDDY? That’s all you can come up with after not having your hands on him for how long?” laughed Ana. “I do not drool!” I laughed, horrified. “Well, maybe not, but you do have a line indented on the side of your face from however you were sleeping,” she said smiling. “I do not!” I protested, but then felt my cheek. Sure enough I had a long groove running the length of my face. That didn’t sound very promising. I glanced at Ana, who gave me a curious look, but we followed Mae back into the kitchen where feast preparations were in full swing. “Sit,” Mae instructed as she poured herself a fresh cup of coffee. She added some sugar and slowly turned to face us as she stirred the caffeine. The soft clink of her spoon against the cup seemed to echo ominously in the silent room. What was she up to? “Um – did I forget to take the trash out or something?” I asked, daring a nervous glance to Ana. Mae cleared her throat, a sure sign of whatever she was about to say was not going to be enjoyable. Oh please – don’t say it. Don’t go there. Yup. She went there. I bet the deed to the house it was because Raef had been curled around me, too. The color drained entirely from Ana’s face. “Mae – you really don’t . . .” I started, but she raised a hand to silence me. It was very possible I would never recover from this conversation. I was sure Ana’s ears were shriveling off her head as Mae spoke. Silence descended on the room, as if a black hole had opened up on the table, sucking all gravity and sound from the kitchen. Mae stood there, glancing at the two of us. I was so mortified. I slid my eyes to the kitchen door that Raef had passed through minutes ago. If he was still anywhere near the side of the house, his supernatural hearing would have just offered him an earful. Kill. Me. Now. Ana, no doubt ready to perform a self-inflicted mental exorcism to erase the past few moments, hopped up from her seat as if she had been scalded. “Right. Good talk. Will keep it under advisement. Gotta get dressed,” she declared, bolting from the room. I think her little feet actually left a smoke trail in their wake. Her leg was definitely all healed. I glanced at Mae and she eyed me over her steaming cup of coffee as she took a sip. 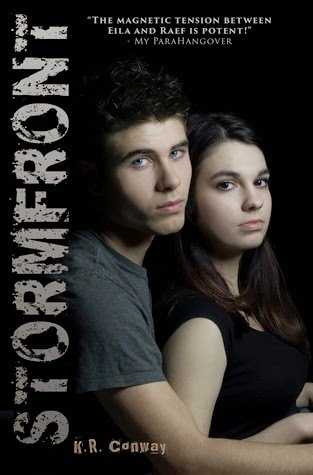 Storm front sounds great, I would like to read this and also the first book.